For ten years now I have been working at Eastside Primetimers providing specialised guidance and support to the charity and not-for-profit, in order to help the sector upskill and diversify by bringing in knowhow from other walks of life. Eastside Primetimers operates as a social enterprise providing consultancy support for social sector organisations. Alongside our main consultancy services, we have a Foundation funded by the trading arm, with a specific mission to invest in the support, development, knowledge and ideas of our member-consultants and individuals looking to transition into the sector. We have helped over 1,000 people make this leap since 2004. 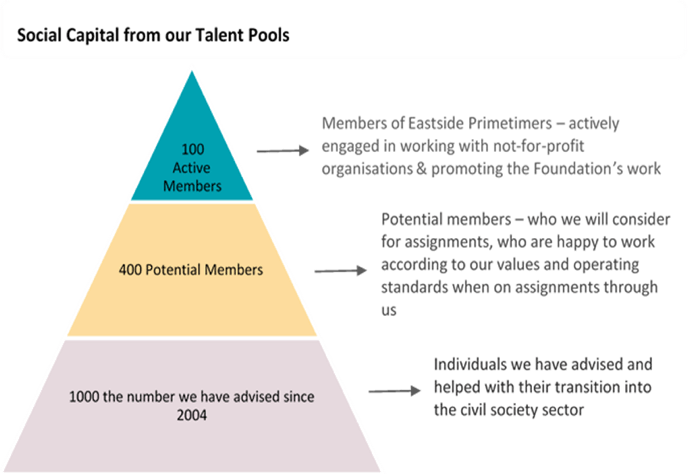 In our highly selective talent pool, we have around 100 members who provide consultancy, interim management, mentoring, coaching and governance support in the charity sector either as volunteers/pro bono or on paid assignments. In addition, we have another pool of talent which we use especially for trustee and Board appointments and these are generally individuals who are not seeking a portfolio career because they are in full time employment or are only looking for a light commitment. We believe that this is the best way that we can reinvest part of our annual profits to build a stronger talent pool for the sector as a whole, to energise our members and reduce the sense of professional isolation they can feel – many of them work remotely and they are spread across different regions of the country. Originally our members tended to be those retiring from the private sector and seeking a social purpose for their skills in their later years (hence the ‘Primetimers’ part of our name). However, over time our pool has diversified to include younger mid-career consultants and people from a wider variety of professional backgrounds, such as charity and public sector professionals. As our Foundation continues to grow in strength, we believe in the importance of adding more diversity to our talent pool across all disability, ethnic, gender, socio-economic and geographic aspects. To strengthen the human capital available to charities and social enterprises, we want to build diverse teams where individuals from a variety of backgrounds can collaborate and share their expertise in the best way possible for their own learning and for the organisations we support. What do individuals get from their membership of Eastside Primetimers? Membership is a two-way relationship. Whilst we have expectations of the individuals who join our network, our members also have expectations in turn about the support they will receive and the type of assignments they may be involved in. We look for individuals who share common behaviours and values including generosity, optimism, collaboration, making a difference and the desire to improve the social sector. At the same time, we recognise the importance and impact of work-life balance and we actively support our members through their changing work priorities. If you are new to the not-for-profit sector or looking to transition, we also run free-to-attend sector information events to give you a view of the sector, what it has to offer you, how to get involved, and how to get yourself ready. If you are interested in learning more about membership with Eastside Primetimers or transitioning into a career in the not-for-profit sector, give us a call and I’d be happy to provide you with more information. Our next ‘Introduction to the not-for-profit sector’ event is on Wednesday 15 May 2019, 5pm – 6.30pm at CAN Mezzanine, 49-51 East Road, London N1 6AH. To reserve your free place now contact Dawn McNulty at dawn@ep-uk.org or 020 7250 8334. 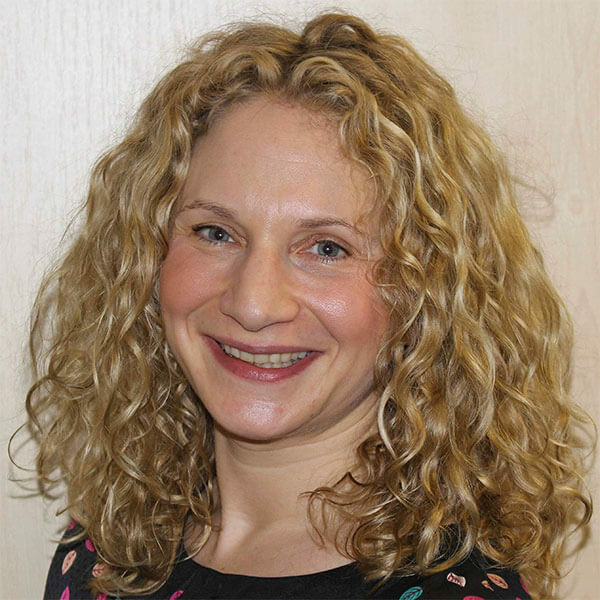 Bernice Rook (bernice@ep-uk.org) is Director of Membership & Resourcing at Eastside Primetimers. This blog originally appeared on Inclusive Boards on April 11th 2019.